It should come as no surprise to many of you to find out that Monsanto actually authored the wording of its own Monsanto Protection Act hidden in the recently passed and signed Continuing Resolution spending bill. How could a major corporation write its own laws and regulations, you ask? Quite frankly I think it’s important to understand that the entire Senate passed the bill containing the Protection Act, but the politician who actually gave Monsanto the pen in order to write their very own legislation is no others than Roy Blunt — a Republican Senator from Missouri. As the latest IB Times article reveals, the Missouri politician worked with Monsanto to write the Monsanto Protection Act. This was confirmed by a New York news report I will get to shortly. As you probably know I do not play the political clown game of left versus right, and instead highlight corruption and wrongdoing wherever it is found — regardless of party affiliation. In the case of Senator Blunt, he admits to colluding with Monsanto, a corporation that has literally been caught running ‘slave-like’ working conditions in which workers are unable to leave or eat (among many worse misdeeds). This is one of the most blatant offenses against the citizens of the United States I’ve seen in a long time. A population that Blunt swore to serve. It’s not for the United States public at all, and it’s a serious matter that I don’t think is properly understood. The passing of this bill into law means that Monsanto is now immune from federal courts regarding any suspension or action on their crops that have been deemed to be dangerous to the people (or the environment). 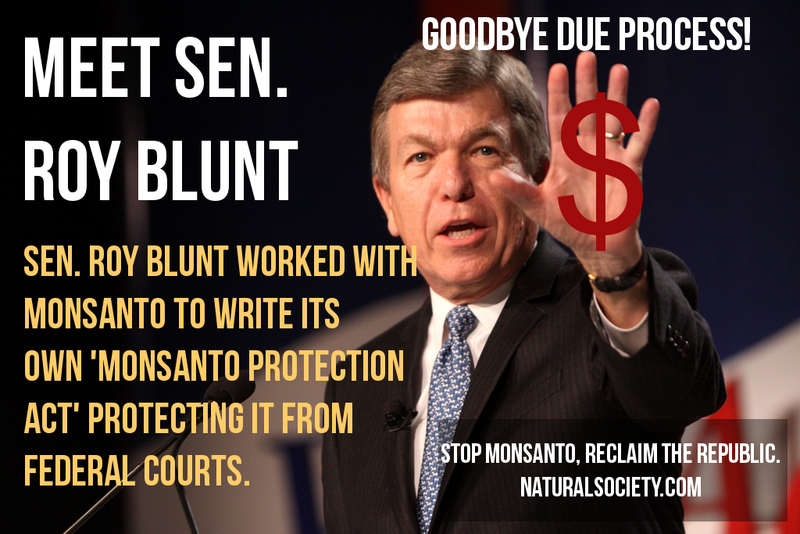 Senator Roy Blunt and those who knowingly passed the Monsanto Protection Act (including President Obama who signed it into law just last night) have chosen to serve corporations over people. Ironic, really, as corporations legally are people — a legal area commonly used to avoid real jail sentences for major CEOs and executives who knowingly were involved with the deaths of consumers around the world. You can contact Senator Blunt through his website and let him know what you think about his decision to let Monsanto write its own Protection Act. No longer can we sit idly by while corporate juggernauts like Monsanto triumph over the people through swindling and deceit. Share this article, the image, and publicly denounce all politicians willing to sell their souls to Monsanto. These polititions don't give a damn about our health and not to wise on their own. When it comes to voting, forget it, I have had it with them all. Liers! There is much and more you can do than just shake your head, you (and correct me if im wrong) live in a country founded on Revolution and the words of "We the People". The best thing you can do now is call to action everyone you know who is willing to fight against such abominations as this and stand together. I have a feeling something like this happened because we are an inactive people who are a lot less willing to stand up and actually participate in "our" government. In times like these "Actions speak louder than words" I think we can all appreciate the relevance of that saying, instead of talking about how horrible this is lets actually do something about it. Read SEEDS OF DESTRUCTION by William Engdahl. Find out the true motivation behind GMOs. Henry Kissinger said it, "Control the food and you control the people". OMG. What I'm surprised is, that people have gone off the rail here. Not that there isn't something to be concerned about, but, this is a SIX MONTH EXTENSION…. NOT a permanent change to an already EXISTING law. Furthermore, it passed with a VETO PROOF majority, so blaming Obama is simply unproductive. An overridden Veto is political suicide when your party is in the minority. Yes, get angry. Yes, write your congress person and let them know we are watching. But put the blame where it belongs. 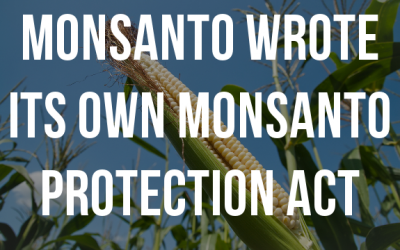 Furthermore, there is no such thing at the "Monsanto Protection Act"…. its a nickname. Like Obamacare. As the latest IB Times article reveals, the Missouri politician worked with Monsanto to write the Monsanto Protection Act. This was confirmed by a New York news report I will get to shortly. The IB times article mentions NOTHING about monsanto writing the bill with Blunt.and he NEVER gets to the NY news report. How do you title an article what he titled this article and then offer no proof? "This means crops that were approved and later found to damage the environment or the public will be immune from United States government action. Theoretically, one million studies could find that Monsanto’s latest creation was causing a massive cancer wave and under this law Monsanto could continue to peddle the crop to the public. " Because of the typo in the graphic, I think some folks may be a bit reluctant to use it. I have fixed the error and you can download a copy at http://www.backyardchickenelearning.com/wp-conten…. Yeah, I know…what is it doing on a website about chickens; it is the best place I could put it. Thanks for pointing this out, Dwayne. I appreciate you fixing it up. I'm going to fix the typo now and re-host the image. Feel free to download the one I fixed and use it. It doesn't make sense for you to fix yours when it is already done. Isn't it sad that our presidenet won't even keep his promises. Does he and his family consume GMO crops? What about all the supporters as well as Monsanto staff? Obama eats organic produce grown in the White House Organic Garden. Why would you pass a bill to make Monsanto above the law when he would never let his own Children eat this poison? It is a very sad turn of events. the POTUS has to sign any legislation that has been passed by majority into law. that's the way the process works. People need to hold themselves accountable for voting for politicians with no conscience regarding this issue. Not all corporations are inherently evil, but the ones that are can really screw up the standard of living for those of us with no financial or legal power. If enough people make a pledge to stop buying heavily processed food, a message will be sent. Monsanto intends to control the global food industry, and our government just gave them a huge leg up. They are far from controlling the global food supply but largely control the US market. They are banned in many countries whose populations are more informed and concerned with the manipulation of their food. People are becoming more informed. Monsanto, Obama, and all signing members of this bill should all be convicted of bioterrorism through the food supply and relieved of their duties from office. Holy Cow! How many offices does this guy need? I am preparing faxes for all of the numbers and would encourage others to do the same. Faxes and phone calls work better because they actually have a record of the call/fax. These they cannot ignore as easily as they can e-petitions, which they do not even count. Fill up their fax machines with faxes of protest regarding this disgraceful act! But I would watch what I say about "M"…since they have written their own protection act that we have no way of knowing what exactly is in it…I would be careful about what you say…they have many very mean attorneys that get their kicks and paychecks to destroy their competition and any negative thing said about them. But, "M" is only doing what our cowardly "representatives" are paid to let them do! Overthrowing the Citizens United "law" would work wonders for the 99%! If anyone has let us down, it is the FDA which is run by "M". I'd really like to repost this, but the ocd in me won't let me repost something that has a graphic on it that says "Godbye Due Process". It just looks dumb, especially on a graphic meant to be repost. I'm with the cause here, but don't make me look dumb while trying to do the right thing. "Monsanto is now immune from federal courts regarding any suspension or action on their crops that have been deemed to be dangerous to the people (or the environment)." If deemed dangerous to the people, that means they just implicated themselves of their crimes. Nullify this Unconstitiutional law at the state level. Get this back into the courts. Forced beyond free will and moral conscience to do Monsanto and their crimes – Burn their fields. The Ban GMO Movement is just getting started. Facebook will not let me post the blunt picture. How much did Obama get in campaign contributions? to bad it was a Republican that actually proposed the legislation to begin with. You mean the Rothschilds wrote the Monsanto Protection Act and its Minions in CONGRESS duly abliged in passing it. Some sources say Sen. Barbara Mikulski was also part of that. Did you find the same? It is truly sad that our current government continues to show they do not care about us citizens. We need to take this country back snd should start with impeaching Obama. Get rid of this congress and start new with younger more educated and caring people. Old is old and needs to go!!!! you might want to actually learn about what an impeachable offense is to start. the POTUS has to sign any legislation that has been approved by the House and Senate by majority into law. that's the way it's always been and how all bills come laws. before criticizing the POTUS maybe you should actually learn how the legislative process works. We are truly living in an upside down world. All I can do right now is shake my head. With a media blackout, these kinds of actions will continuously occur and the public will be the losers in every way; economic, health, and education. Eventually, who will they sell their "products" to if we all get sick from them? In the meantime, huge profits are being harvested from synthetic medicines peddled by pharmaceutical companies that are treating all these industrially engineered occupational and consumer diseases. The Corporations will either continue to sell their products (using foreign labour for the manufacture of their products) to foreign countries while sheltering in the American tax haven; or they'll pack up and take their golden parachutes and enjoy the fruits of their corporate success. Either way they'll come out of it just fine and no doubt live in the lap of luxury. Oh wait!! The execs will become hugely successful consultants and embark on global speaking tours so other corporations can train their executive workforce to be equally productive and knowledgeable on how to make even more money. Robin Hood was and still is a fairytale because when Corporations have the politicians in their pockets it becomes a huge money pool and they have the only tickets, any attempt to improve the lives of the working poor will be blocked, i.e minimum wage rise opposition.